The Sisters of Compassion’s new purchase, Compassion House in Luke’s Lane, central Wellington, was opened on 23 February. The Governor-General of New Zealand, The Honourable Anand Satyanand, gave the following speech. Ladies and Gentlemen, I greet you in the languages of the realm of New Zealand – English, M%u0101ori, Cook Island, Niuean and Tokelauan. Kia Ora, Kia Orana, Fakalofa Lahi Atu, Taloha Ni. 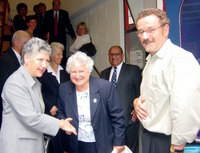 More specifically, may I greet you: Sister Rae Berry, Congregational Leader of the Daughters of Our Lady of Compassion; Sisters of Compassion; representatives of the Wellington People’s Centre, Downtown Community Ministry, Parent Help and Prisoners Aid and Rehabilitation Society (PARS). Today’s opening is significant at two levels. First, it signals the end of uncertainty for the four main tenants of Compassion House. Until now, each organisation has battled to remain in the centre of the city – in the face of rapidly rising commercial rents and increasingly parlous tenancies. For many charitable organisations in New Zealand, money is so often very scarce. It can be a constant struggle to provide support to those communities you serve when you have to watch every single cent. It is even harder when external costs, such as rents fuelled by the makeover Wellington has achieved for itself with symptoms like the apartment boom, are beyond your control. I am advised this was the case here. By purchasing Compassion House, the Sisters of Compassion have removed uncertainty by providing you with secure tenancy at affordable rates. You now have much needed facilities to provide support for those individuals and families on benefits and low incomes. Second, today’s opening also marks an important, but subtle shift in New Zealand’s community services sector towards a closer alignment between various groups and Churches. It will be known that Compassion House was purchased by the Mother Aubert Home of Compassion Trust Board – an entity of the Catholic Church. However, you will also know that the major tenants are either of other faiths, and/or not aligned specifically to any particular faith. This reflects a reassuring commitment by New Zealand’s community sector to prioritise the needs of those being served, rather than the philosophy or the faith that drives the enterprise. By working more closely together, everyone is in a better position to identify where the greatest needs lie. By sharing resources, you are better equipped to meet those needs. Compassion House is a wonderful example of what can be achieved by recognising that the desire to help people in need is a common bond. For the Sisters, Compassion House provides them with a way to support those groups who are doing work they would have done, had they been able to do it themselves. I congratulate the Order for purchasing and refurbishing Compassion House. I believe the Sisters have done a great service for the people of Wellington. As to the tenants of Compassion House – Downtown Community Ministry, Parent Help, the Wellington People’s Centre and Wellington Prisoners Aid and Rehabilitation Society – may I issue a wero or challenge to you. Enjoy Compassion House and use this community of caring to focus your ongoing efforts on those people of Wellington who need you – in this essentially Wellington location. I began speaking in all the New Zealand realm languages. May I close by speaking in M%u0101ori issuing greetings and wishing you good health and fortitude in your endeavours. Both the Governor-General and Mrs Satyanand have had close associations with tenants of Compassion House – he as a board member of PARS and the Parole Board and she was involved with advocacy services for Wellington People’s Centre.